Seven people have been arrested and a Bentley car seized as part of a police fraud investigation into loft insulation firms. Officers raided homes in Bournemouth, Christchurch and Southampton on Monday. They also searched the offices of NRG and Thermal Home Insulations, trading from premises previously occupied by Airtight Renewables in Bournemouth. Police said the inquiry involved the "sale, supply and installation" of loft insulation. 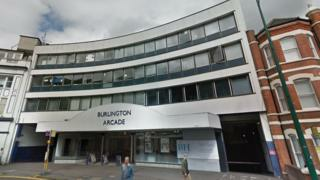 A new Bentley car was seized outside the offices of Thermal Home Insulations, which occupies part of Burlington Arcade in Bournemouth. Five men and one woman have been arrested on suspicion of conspiracy to defraud. A second woman has been arrested on suspicion of concealing, disguising, converting, transferring or removing criminal property. Airtight Renewables Ltd declared net assets of £209,436 in 2016.